Protect a dual gauge regulator from falls. A very worthy investment. 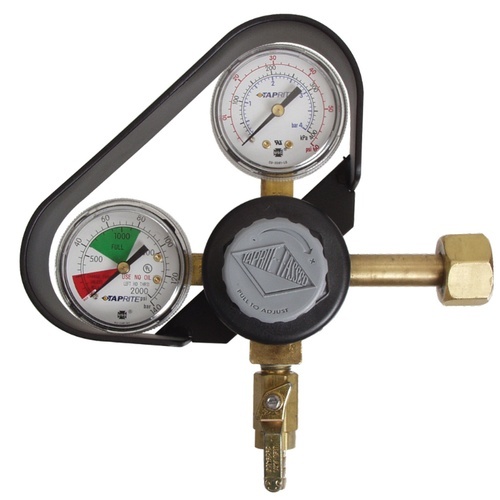 If you are moving your tank around with regulator attached, a gauge cage becomes a necessity. While made by Taprite to work with our D1060 and D1070 Dual Gauge Taprite Regulators, it will also work with most other brands. Mounting bolt and washer included. I picked this to avoid repeating the damage to a regulator caused when a CO2 bottle was knocked over. Have one. Love it. Need another. Replacing leaking regulator. Adding some insurance this time. Quality and cost specifically for the regulator I own. because I've broken a gauge in the past. Protect your gauges ! Been there done that. A must have. This cage installed very easily over the gages, with only 2 screws. It is very stable and firm, providing excellent protection for the gages and regulator. I'm really glad I purchased this cage. A must to have,just to be on the safe side. Hi Brian - It's not so much will it tip over, it's when will it tip over. Always a good idea. Best gauge protector imo. Slim and does what it was designed for. Perfect fit and full protection for the gauges. Almost didn’t order one of these but glad I did. Knocked my CO2 tank over during setup. Gauges are fine and not a scratch on the cage. The gauge cage is worth the price to protect your equipment. I wish my O2 regulator (non Taprite) had a gauge cage available when it was knocked over causing damage to one gauge. I can't remember how many times I've been lucky that I haven't damaged the regulator by knocking over the cylinder. Easy to install - great protection! decided to buy this after knocking over and breaking a gauge on my last regulator. It fits well and hopefully will save my gauges from the next fall. Works great fast shipping! keeps the old regulator from falling and getting crushed.